Golden perch bred in the Goulburn River as a result of environmental watering in 2014–15. Environmental water delivered in 2014–15 focused on providing cues for golden perch breeding, along with re-establishing plants on the lower banks of the river which were lost during the drought and subsequent flooding. 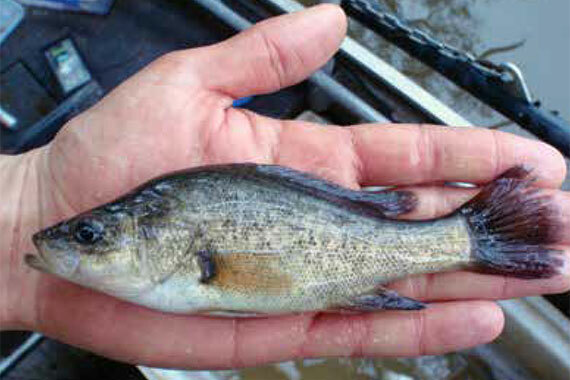 Geoff Earl, Environmental Water Flow Coordinator with the Goulburn–Broken Catchment Management Authority, said perch breeding was monitored during the delivery of a spring watering in 2014, with some promising results. "The monitoring found the eggs were more widespread than in previous years and there were large numbers of eggs collected from Murchison to the River Murray," Geoff said. "Monitoring also included electronic tracking that follows fish movement in response to environmental watering. "Preliminary results of this tracking shows firm evidence of golden perch movement in response to the increased spring flows at the time they also spawned." Angler reports supported these findings, with recreational fishers reporting higher fish numbers and better fishing conditions in 2014–15. Environmental watering in the Goulburn River also assisted the recovery of plants on the lower banks of the river, with new plant patches establishing on the previously bare lowest metre of the river bank.